See: How to Appreciate Art. One of the main characteristics of Impressionism was its mastery of light and colour, a feature exemplified by the works of Claude Monet (1840-1926), Auguste Renoir (1841-1919), Camille Pissarro (1830-1903) and Alfred Sisley. In fact only Monet and Sisley would remain devoted to plein-air painting, the painterly technique most closely associated with the Impressionist group. Born in Paris, of well-to-do parents, Sisley was sent by his father, an English silk merchant, to London to perfect his English and to learn business. He preferred to visit the museums and took little interest in commerce. On his return to Paris he joined Charles Gleyre's studio where he learned the art of painting. Until 1870 he was an amateur painter; his output was small because, thanks to his father, he did not have to earn his living by it. When the Franco-Prussian war ruined the family silk business, he had to work in earnest and decided to become a painter. Married and the father of a family, he tried to turn his talent to good account, but from this time on he knew the bitterest poverty, getting only the most miserable prices for his pictures. Art collectors like Paul Durand-Ruel (1831-1922), Dr Georges Viau (1855-1939), and Eugene Meunier (18411906), were his first admirers, and tried to help him but without much success. Unfortunately for Sisley, who spent the last 30 years of his life in poverty, Impressionist landscape painting was neither popular nor lucrative until after his death. Furthermore, because of his limited oeuvre, he was generally overshadowed by the other Impressionist painters who had wider repertoires. For some of Sisley's best plein-air Impressionist pictures, see the waterscape Canal St Martin (1870); the damp, foggy country scene in Misty Morning (1874); and the snowscape Snow at Louveciennes (1878). Sisley, together with Monet, is the chief representative of Impressionism in the true sense. His landscapes, mostly of an extreme delicacy, are composed in the modern idiom which helped to make his canvases so light and limpid. 1871 to 1874 was a prolific period for Sisley and his work was of a rare quality. Living near Paris, he was especially the painter of the Ile de France and the Valley of the Seine. He painted in turn at Louveciennes, Voisins, Marly-le-roi and Meudon. He was attracted by the villages bordering the Seine. He knew how to capture the poetic beauty of rivers and their green banks. Tree-bordered roads disappearing into the distance were a subject which he was always happy to paint, as Camille Corot was before him. The Chemin de la Machine is one of the best examples. The influence of Corot is noticeable, allied to a new idea of landscape in a clear golden harmony. This simple road with its rows of autumnal trees vanishing into the distance unrolls beneath a sky of a purity and lightness absent from Sisley's landscapes after Monet's influence dulled them round about 1885. The disappearing road effectively connects the foreground with the background, and provides some interesting effects of perspective. Here, the illusion of three-dimensional space is maintained most strongly by the row of trees stretching into the distance, which gives rhythm to the painting, and enhances the impression of depth. The artist also takes advantage of the slight rise in the road surface to create a more interesting vanishing point, just off centre, and to obtain a plunging view over the valley below. Notice also how Sisley humanises his landscape by adding a few small figures in the style of the Dutch master Johan Jongkind (1819-1891). 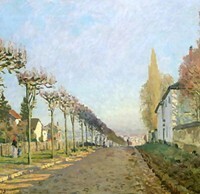 Some experts consider that Sisley's Chemin de la Machine, Louveciennes, is reminiscent of The Avenue of Middelharnis (1689, National Gallery, London) by Meindert Hobbema of the Dutch Realism School, but this is debatable. The Avenue is a famously bare and completely flat landscape painting, with an entirely different light and atmosphere. The composition of Chemin de la Machine may be influenced by Corot, but (apart from Sisley) only Monet could paint such a luminous summer sky. NOTE: To find out about French Impressionism and the artists who started it, please see our 10-part series, beginning with: Impressionism: Origins, Influences.  La Grenouillere (1869) by Monet.  Impression, Sunrise (1873) by Monet.  The House of the Hanged Man (1873) by Paul Cezanne.  Vegetable Garden with Trees in Blossom, Spring, Pontoise (1877) Pissarro.  Path Leading Through Tall Grass (1877) by Renoir.  The Red Roofs (1877) by Pissarro.  For an explanation of other Impressionist landscapes, see: Homepage.